(FinalCall.com) - On February 27, two days after delivering the historic Saviours’ Day keynote address in Detroit, Mich., the Honorable Minister Louis Farrakhan sat down with Al Jazeera Correspondent Fadi Mansour to discuss the geopolitical landscape in Iran, Iraq, Israel, Somalia; the hidden hands in the Sunni/Shi’ite conflict; and again called for regime change here in the United States and the removal of the neoconservative advisers along with the rest of the Bush administration. “I didn’t mis-describe the administration of the United States. They are liars, and they are murderers, and they are guilty of high crimes, and they should be removed, for they have violated the Constitution of the United States of America, and have violated the peoples of the world,” said Minister Farrakhan. 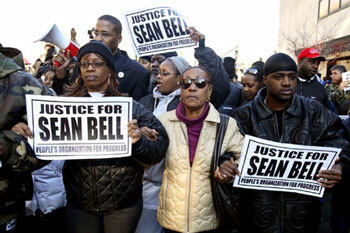 NEW YORK (FinalCall.com) - The murder of Sean Bell on November 25, 2006 is not an abberation, according to community and social activists. In fact, they say when the dots are connected in a socio/political context, it is easy to understand why only people of color are shot down in New York City streets like dogs. “People must see the killing of un-armed Blacks as a nationwide epidemic—not just something that happens in New York City. The 92-year-old grandmother Catherine Johnson wasn’t killed by police in New York City; she lived in Atlanta, Ga.,” Mr. Dix stressed. (FinalCall.com) - With the launch of their English language channel in November of 2006, Al Jazeera has begun to challenge the former dominance of BBC and CNN in the area of worldwide news reporting by providing a more balanced view of current events. On February 27, two days after delivering the historic Saviours’ Day keynote address at “Fard” (Ford) Field in Detroit, Mich., entitled “One Nation Under God,” the Honorable Minister Louis Farrakhan sat down with Al Jazeera Correspondent Fadi Mansour to discuss the geopolitical landscape in Iran, Iraq, Israel, Somalia; the hidden hands in the Sunni/Shi’ite conflict; and again called for regime change here in the United States and the removal of the neoconservative advisers along with the rest of the Bush administration. When Mr. Mansour asked why the Nation of Islam is made up primarily of Blacks, when Islam is open to all races, Min. Farrakhan responded, “If you look at the Prophet [Muhammad], peace be upon him, why were the majority of his followers in the beginning Arabs? It was because he came to the Arabs, first, and then to the world. When asked about the global conflicts and America’s involvement in the affairs of sovereign nations, specifically Iran and North Korea, Min. Farrakhan pointed out that for America, even as a superpower, challenging nations now is not as easy as it once was. “There are 192 nations on this earth. America has troops in 135 of the 192 nations. What are American troops doing all over the world like this? America has surrounded Iran and Russia with bases and troops and nuclear weapons. Russia feels threatened; Iran feels threatened. Iran should not be denied the human right to knowledge. Atomic knowledge should be in the arsenal of knowledge of every nation, and if Iran wants to use Atomic knowledge for peaceful purposes, she is in accord with international law,” Min. Farrakhan said. “Every nation of the earth wants friendship with America, but America can’t have it if she is going to be the world’s number one bully. She can’t frighten Iran anymore. She can’t frighten North Korea anymore, because if you throw at Iran, Iran can throw back; if you throw at North Korea, North Korea can throw back. North Korea and Iran and Syria [are not] Grenada and Panama,” he explained. Mr. Mansour then asked about the American presidential elections in general and specifically, and if America was ready for a Black president. Min. Farrakhan said, “Who is talking about the international bankers that fund both sides of a war? Who is talking about the international bankers that set up the World Trade Organization? Who is talking about the international bankers that destroy the sovereignty of nations? Who is talking about the international bankers who are promoting this idea, that we should give up our natural resources and begin to privatize? And who are the private persons who are buying up the wealth of the world? It doesn’t make any difference who is the President, if you cannot stop the madness that is going on. 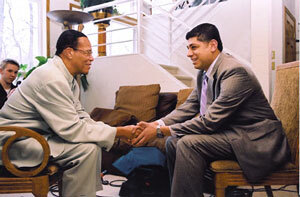 Photo: The Honorable Minister Louis Farrakhan greets Al Jazeera Correspondent Fadi Mansour before interview. - With more than 18 bureaus across the globe; together with the Arabic channel, Al Jazeera Networks have more than 60 news bureaus around the world. - Al Jazeera TV has been in existence and available in Arabic since 1996. - Al Jazeera’s English language channel was officially launched in November of 2006.